BlacMail which offers convenient push mail service has now joined hands with the Mobile major LG Electronics to offer BlacMail push mail service on LG Mobiles. 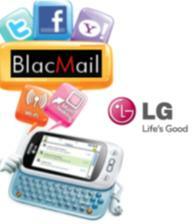 This push mail service is now incorporated in the latest LG Cookie Glide GT 350i phone which is powered by BlacMail. BlacMail push mail service, uses sophisticated messaging server based technology to deliver real time email updates from multiple user accounts to a wide variety of phones, from inexpensive and popular models to smart phones, which comes with a user experience which is available to only high-end push mail phones. Of late, BlacMail has been heralded as a breakthrough mobile technology innovator because it effectively crashes the barriers to mass adoption by eliminating the need for GPRS connectivity that is required of all other push mail services. The handset LG Cookie Glide GT 350i in which BlacMail is incorporated is a sleek messaging phone with a slide out 4 line QWERTY keyboard, resistive touch enabled 3-inch WQVA screen and 2MP camera. Interface has been designed for social networking and communication by providing full integration with sites like Facebook and Twitter. It also aggregates information from multiple social networks onto one screen, making it easy to instantly check status updates, keep track of friends and respond to messages. The keypad also comes up with a set of dedicated short cut buttons for direct access to popular social networking sites. Users of Cookie Glide LG GT 350i mobile phone can experience the convenience of BlacMail push mail out-of-the box through a free trial bundled in it. An easy setup enables the BlacMail push email service without the need for a GPRS plan. BlacMail works on a prepaid credit basis. After the initial two-month free trial on LG Cookie GT 350i, users can visit www.blacmail.in and recharge their BlacMail account using their credit or debit card. Dude..I don’t mind paying if the product is good. I hav tried BlacMail…it is very neat. All he emails got pushed to my phone as soon as they came to gmail id. Plus I didn’t subscribe to any GPRS!! good thing is that one doesn’t need gprs. bad thing is that it’s free only for 2 months.